Published on May 13, 2018 by Martyn. Be the first to comment! 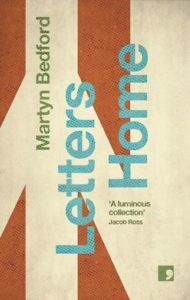 My tour of the blogosphere continued with a recent guest spot on the Papertrail Podcast website to take part in a Q&A interview about the themes I explore in my short-story collection, Letters Home, and my writing more generally. Q: A lot of these stories feel like they’re examining the absence of something. In some stories it’s literally about people searching for something, or trying to get a glimpse of it. In others it’s more abstract, and the absence is never directly addressed. What draws you too examine these moments? A: I’m interested in the tension between life as it is (or seems to be) and as we might wish it to be, between what we have and we don’t or can’t have, or what we’ve lost. The boy whose mother has disappeared, the asylum seeker separated from his wife and son, the widower facing another lonely Christmas dinner, the sole survivor of triplets . . . each of these characters is trying to reconcile what is present in their lives with what’s absent from it. I’m exploring the notion that these empty spaces in our existence don’t signify something missing, as such, but are as much a part of who we are as the silences between the notes are integral to a piece of music. To read the Q&A in full, and to check out other books-related interviews, articles and reviews on the Papertrail site, click here.